One of the best things about holidays is getting together with family and having a huge feast. One of the worst things about the holidays is that you probably spent close to a week’s grocery money on that huge feast. If you are of the frugal mindset or on a tight budget, it can be overwhelming to spend all that money for just one meal. Here’s where preppernomics comes in: preserve it! One of the best things about holidays is getting together with family and having a huge feast. One of the worst things about the holidays is that you probably spent close to a week’s grocery money on that huge feast. If you are of the frugal mindset or on a tight budget, it can be overwhelming to spend all that money for just one meal. So now, your refrigerator is stuffed to the point that you have to lean against the door to close it and you never want to see another bite of turkey, ham, or roast beef again, let alone stuffing or green beans. So what is a thrifty prepper do with all of that delicious bounty? 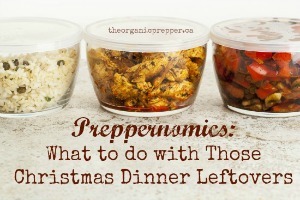 Here’s where preppernomics comes in: preserve it! Nearly all of your post-Christmas goodies can be put away for future use, adding to your stockpile. Don’t let anything go to waste. Many people wait too long to preserve the food and end up having to throw most of it in the trash. It’s important to get on this right away. I’ve published many of these after-holiday suggestions before, but for some readers this information will be all new. For those of you who have been around a long time, please share your own leftover preserving methods in the comments section! Nearly all leftovers can be successfully frozen and used in other meals. (For best results, use a vacuum sealing system.) You can find Tess Pennington’s guidelines on freezing food HERE. Don’t be deterred if your veggies are in a sauce or highly seasoned. When an item is not particularly appetizing in its original form, soups and casseroles made from combined freezer contents can be delicious. Check out this article about The Fine and Frugal Art of Repurposing Leftovers for more ideas. Freeze desserts in individual servings for brown bag treats. They’ll be thawed out and delicious by lunch time. Another way to preserve your leftovers is by dehydrating them. Whether you have a commercial dehydrator (high end or budget ) or you use your oven on a low setting, you can fill many jars with home-dried holiday leftovers. Dehydrated foods have several great benefits to your stockpile. First, they require no refrigeration and can happily reside in a jar in a cool dark place for several months. Second, they don’t require lengthy cooking time to prepare when it’s time to use them – boiling water is all it takes. And finally, because the removal of moisture causes the food to shrink, the reduced size means that you can store a lot more food in a lot less space. If you don’t have a dehydrator, you can use a low heat in your oven, with the door slightly cracked to allow moisture to escape. If you’re new to dehydrating, you can find detailed instructions HERE, and you can use this handy rehydration chart for reconstituting the foods when it is time to use them. Dehydrate the remainder of your veggie tray. I find that veggies dehydrate very nicely when they are coarsely grated with the biggest holes in the cheese grater. Be sure and squeeze the excess moisture out with a paper towel to cut down on the drying time. Dehydrate leftover stuffing, then rehydrate (“Stovetop Stuffing”-style) with broth when it’s time to serve it. Everyone knows that canning is my favorite way to preserve food. Most of these foods require pressure canning to be safely preserved. I’ve included some links to specific instructions. Can your ham leftovers and broth. Can homemade pork and beans with bits of leftover ham. Can your leftover turkey and broth. Can some of your turkey and broth in the same manner as Chicken Needs Noodles Soup. Shameless plug – you can find all of these canning recipes, lots of other recipes, and instructions on canning your own family recipes in my new book, The Organic Canner . How do you make the most of a big holiday feast? What do you do with all those yummy leftovers? Please share your ideas in the comments section!